Does the United States derive economic benefits from its overseas security commitments, and if so, to what extent? Since the 1940s, U.S. international leadership has been justified, in part, by claims of a positive relationship between global stability and domestic prosperity. However, the economic returns from U.S. overseas security commitments have proved extraordinarily difficult to measure. Some policymakers and academics now support reducing or eliminating such commitments, especially in this era of mounting fiscal pressures. RAND researchers use advanced econometric techniques and new data on U.S. overseas security commitments to explore whether and to what extent the United States derives economic benefits from these commitments. The analysis finds that the commitments have positive and statistically significant effects on both U.S. bilateral trade and non-U.S. global bilateral trade. The authors find mixed evidence of the effects on trade costs and no evidence of any effects on civil conflict, either for better or for worse. The authors estimate that a 50-percent retrenchment in U.S. overseas security commitments could reduce U.S. bilateral trade in goods and services annually by as much as $577 billion — or 18 percent — excluding trade with Canada and Mexico. Based on conservative assumptions, the resulting annual decline in U.S. gross domestic product (GDP) would be $490 billion (in 2015 U.S. dollars). Others suggest that the GDP benefits of an 80-percent retrenchment could reach $139 billion, but that is less than one-third of the estimated economic losses from just a 50-percent retrenchment. U.S. policymakers should carefully weigh the potential losses against the potential gains when considering large-scale retrenchments of U.S. overseas security commitments. We find solid evidence that U.S. security commitments have significantly positive effects on U.S. bilateral trade. Doubling the number of U.S. security treaties with other countries would expand U.S. bilateral trade by an estimated 34 percent. Doubling the number of U.S. troop commitments overseas would increase U.S. bilateral trade up to 15 percent, depending on the armed service. Both U.S. personnel and treaties have positive effects on non-U.S. global bilateral trade. This means that countries with U.S. security commitments conduct more trade with one another than they would without the commitments. Doubling the number of U.S. security treaties with other countries could expand global bilateral trade by more than 50 percent, while doubling the number of U.S. troop commitments could do so by as much as 10 percent. For both U.S. and global bilateral trade outcomes, the increased trade occurs primarily with new trading partners rather than ongoing trading partners. Our analysis of civil conflict provides no significant evidence that U.S. security commitments influence either the prevalence or intensity of civil conflict, either for better or for worse. We find mixed evidence regarding the effects of different kinds of U.S. security commitments on the costs of shipping by air or water. We consider the effects of a 50-percent reduction in U.S. overseas security commitments. Our estimates indicate that U.S. bilateral trade would fall by approximately 18 percent, excluding trade with Canada or Mexico. Using 2015 nominal trade data, this would be equivalent to a loss of trade in goods and services of approximately $577 billion. Based on conservative assumptions from the economics literature, we estimate that the resulting decline in U.S. GDP would be approximately $490 billion. This amount is three and a half times greater than the estimated $139 billion in GDP gains associated with an even larger 80-percent retrenchment plan proposed by some academics and policymakers. Our results indicate that U.S. policymakers should carefully weigh the potential losses against the potential gains when considering large-scale retrenchments of U.S. overseas security commitments. The direct budgetary savings may be substantial, but the indirect trade costs are likely to be far larger. Policymakers who reduce these commitments would face not only the immediate problems of how and where to make the reductions but also the future problems of a poorer United States. The research reported here was sponsored by Maj Gen Steven Kwast, Air Force Quadrennial Defense Review Office, Headquarters United States Air Force and conducted within the Strategy and Doctrine Program of RAND Project AIR FORCE. 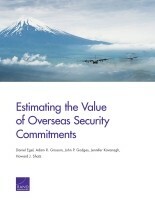 Egel, Daniel, Adam R. Grissom, John P. Godges, Jennifer Kavanagh, and Howard J. Shatz, Estimating the Value of Overseas Security Commitments. Santa Monica, CA: RAND Corporation, 2016. https://www.rand.org/pubs/research_reports/RR518.html. Also available in print form.